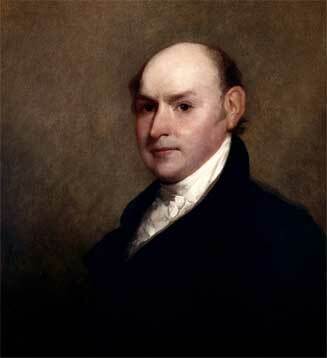 John Quincy Adams was born in Braintree, Massachusetts to Abigail and John Adams. He witnessed the Battle of Bunker Hill together with his mother at the age of 9. Adams spent much of his childhood in Europe, mostly in France while his father was serving as Minister. At the age of 15, the young John Quincy Adams served as Secretary to the Mission to Russia. On his return to the United States, Adams studied at Harvard. After his graduation, he studied law. President Washington appointed Adams Minister to the Netherlands in 1794, a position he held until 1797, when he became Minister to Prussia. In 1801, Adams returned to the United States and in 1802 was elected Massachusetts State Senator. In 1803, he was elected U. S. Senator. From 1809- 1814 Adams served as the first U. S. Minister of Russia. While there, he turned down an appointment to the U. S. Supreme Court. In 1814 he became the head of the delegation charged with negotiating the Treaty of Ghent which ended the War of 1812. From 1815-1817, Adams served as Minister to Great Britain. From 1817-1825 he was Secretary of State in the Monroe administration. He was instrumental in improving relations with Great Britain. In addition, he was a strong supporter of the doctrine that became known as the Monroe Doctrine, which helped limit European involvement in the affairs of the Western Hemisphere. John Quincy Adams was a proponent of large scale federal involvement in economic development. He called for federal expenditures on canals and roadways to link the United States. He also proposed government support for scientific research. His proposals were met with derision, and he did not receive enough support to carry them out. Adams attempted to run the government as if in an apolitical bureaucracy, which resulted in growing opposition which would ultimately unseat him. After his retirement from the Presidency, Adams enjoyed a distinguished career lasting 17 years in the House of Representatives. J.Q. Adams was the first President whose father was also a President. First President elected without recieving a plurality of the popular vote. First President whose son was married in the White House.